Feather Diesel Services (FDS) has recently taken delivery of cutting edge DPF cleaning technology from Hartridge, world leaders in diesel fuel injection test equipment. 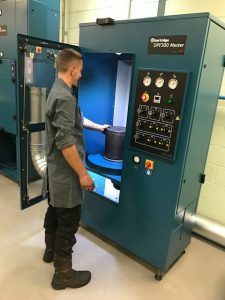 This will allow testing and cleaning of DPF units which have become blocked during vehicle use and often lead to harmful black smoke and emissions. This system from Hartridge offers an environmentally friendly alternative to existing wet-based cleaning generally used in the UK. With changes to the MOT law in May 2018 DPF removal remains illegal but will now result in a failed test. FDS can now offer a cost-effective alternative to DPF replacement or vehicle write off. This UK wide service is now available to car, van, bus, truck and plant operators with DPF problems. For further details contact our Halifax office on 01422 387800. *Free Collection & Delivery Service for orders of £100+ orders (excluding VAT and any surcharges).